A British drama about scientist Charles Darwin has been selected to launch this year's Toronto Film Festival. 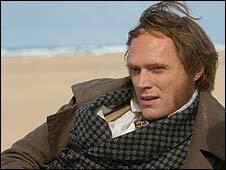 Creation, which stars real-life couple Paul Bettany and Jennifer Connolly as Darwin and his wife Emma, will open the event on 10 September. The release of the partly BBC-funded film - out in the UK on 25 September - coincides with the 200th anniversary of the evolution pioneer's birth. The Toronto Film Festival runs until 29 September in Canada's economic capital. Directed by Jon Amiel, Creation explores how Darwin came to write his groundbreaking work On the Origins of Species. The film shows the young scientist grapple with his wife's deep religious convictions and his grief over the death of his young daughter. Other films announced by festival organisers include The Invention of Lying, a fantasy comedy co-written and directed by Ricky Gervais. The Office and Extras creator stars in the film as a writer living in a world where mendacity does not exist. Toronto will also screen Steven Soderbergh's film The Informant, in which Matt Damon stars as a real-life whistle-blower. In addition, the festival will premiere new movies starring Michael Douglas, Clive Owen, Edward Norton and Colin Farrell. On Tuesday, the festival's chief executive Piers Handling announced that sponsorship funding had fallen this year, forcing cuts to travel and entertainment budgets. "We've had to make some very hard decisions," he told reporters as he announced some of this year's titles. Founded in 1976, Toronto is one of the world's largest film festivals and is a traditional launch pad for titles aiming for awards contention in the following year.